Over the last few years, atheism has become increasingly popular. That is probably because of two reasons – firstly, the majority of atheists are no longer scared to express their views in public and secondly, more people are beginning to interrogate conventional religious practices in search of empirical evidences. Atheists all over the world are gradually realizing that they can now be outspoken without the fear of being berated and so they are seeking different ways to express themselves. The bumper sticker happens to be one of the many ways in which heathens prefer to express themselves because they are a great way to show hundreds of others what you believe in by simply driving past them every day. They convey your message simply without requiring you to put in a lot of effort. All you need to do is stick a sticker to the back of your vehicle and go! Atheist Republic has several funny atheist bumper stickers that will help you convey your beliefs in a light-hearted manner. Are you ready to pick your perfect bumper sticker and let those behind you know you alone decide your identity? Then start browsing through out gallery right away and pick a sticker of your choice that can either make those behind you laugh their wits off or make them ponder over something more meaningful. 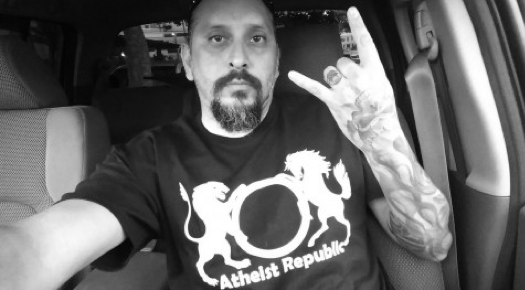 You can maximize this simple opportunity to deck up your vehicle by reaching out to others who know little about atheism and educating them in the process. This may not seem like a feasible idea at all times, but from time to time you will have people approaching you to question you about your stand and then you can tell them more about atheism and reasons why they too should consider similar approaches. On a much lighter note, our wide selection of funny atheist bumper stickers is meant to make you laugh while also enabling you to express yourself. So, which one of our many designs will you choose today?